10 Tips to Make your Facebook Page Work For You! Here is the ugly truth about Facebook. Facebook is a pay to play platform. For the past several years Facebook has been tweaking their algorithm to directly effect your organic reach. If your new to Facebook for business everything I just said may be gibberish to you. To put it this way. If you think that people are going to naturally stumble across your page and automatically like it you are sorely mistaken. You have to PAY facebook to grow your reach and influenence or your can grow your audience "organically" Growing your FB fan base is hard work. Engaging with your audience is hard work. Building your loyal following is hard work. But the hard work pays off in substantial and tangible ways. You grow your reputation and you grow your bottom line. Everyone who likes and follows your page and who you build an interactive relationship with is a potential brand ambassador for you. I have looked at literally hundreds of Escape Room Facebook pages and I have noticed a few common traits among them. Most ER owners have no idea of the power behind their FB page. Their page is a stale bulletin board of player photos and nothing more. Many Escape Room pages don't engage with their audience eliminating the purpose of liking your page. Without engagement there is little to no reason for someone to like your ER Facebook page. The vast majority ER page owners don't post real content for their audience to like, comment and share, further reducing the reasons for people to like and follow your page. You have got to give your audience a reason to keep liking and following your page. A helpful bit of advice about your Facebook business page. DON'T BE A HIGH PRESSURE SALESMAN. There is a principle called the Pareto Principle also known as the 80/20 rule. 80% of your posts should be usable content for your audience to share. The other 20% of your posts can be "salesy" meaning you are actively promoting your business. So what steps can you take to increase the organic reach and engagement of your Facebook page? Here are 10 suggestions to get you going. You don't have to do all of these things but if you do you should see your page likes increase, your organic reach increase and your bottom line grow. 1. Like other pages as your page, and comment (in a non-competitive way) on their posts. Why should you like other business pages as your page? Simple, it shows that you are an involved owner and business person interested in your community and helping it grow. When you interact with other businesses as your page you also gain exposure to their followers who may not know you exist. Once you like a Page, you can also interact with it. Drop a note, mention the page in a post, and get to know the people behind the page. This fosters good relationships with other business owners and grows trust in you. You can also see what types of posts other pages are creating and see what works. While I don't condone ripping off someone else's ideas, I strongly condone emulating they type of posts that work. With enough interaction with a business page and building a strong relationship with it's owners you also create an environment of cross-promotion and mutual support. Do you have a special event coming up? See if they'll plug it on their page. 2. Tag businesses that hold events at your location. 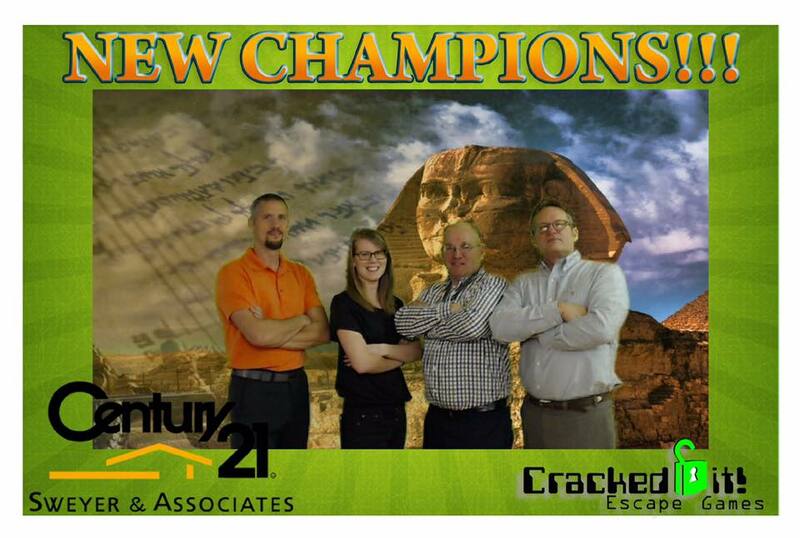 When we have a corporate group come play at Cracked it! Escape Games for a team-building or team-bonding day we take the standard photo of them after the game but we brand it with their corporate logo. When we post those photos we tag the company page. Many times the company page will share that photo to their fans resulting in additional traffic to our page. The team members that came to the events also comment, like and share the photo to their own pages further spreading the word about us. As an example, this week we had a local real estate company book our facility on a night we are normally closed. They appreciated the extra efforts we took to ensure that their event was fun and memorable. They have shared our photos to their 2,907 followers and nearly every one of the group is going to come back and play again. Interacting with our community of followers has established us as a trusted brand. We make a sincere attempt to respond to every single review. This begins the conversation with our guests and allows others to see what kind of business we are, what are our values, and how we feel about our guests. This is a customer service business. Customer service does not begin with the initial sale, it begins long before that when guests are researching your escape room. According to a survey conducted by Brightlocal.com "84% of people trust online reviews as much as a personal recommendation". By responding to reviews future guests see that they are not walking dollar signs. Reviews are the first opportunity for them to evaluate your business. They are getting a personal recommendation. 4. Interact with your page. Oh, Look! The Escape Room posted more pictures of players I don't know. Said no one, EVER! When your Facebook page is an electronic bulletin board just for hanging player pictures you are not using it to it's fullest potential. When you look at your page and guests take the time to comment, and share your posts, they are telling you that they want to connect with you. Sometimes a great question will be asked in a post, that is your opportunity to reinforce your brand message. At Cracked it! Escape Games WE PUT FUN FIRST, our fans want to play and connect. We give them that chance. Like their comments. Engage your fans and they will keep coming back. Everybody loves free stuff! You can run contests on your businesses page as long as it adheres to Facebook guidelines for contests. Contests increase your engagement and keeps your fans coming back for more. A great guideline is to ensure that when you run a contest ensure that it has a compelling photo or better yet, video. Here is a creative contest put on by The Exit Games in Wilmington, NC. A scavenger hunt is a fantastic way to get people out in your community as well as a great opportunity to cross promote with other businesses. Everybody loves freebies and discounts. Reward your followers periodically with exclusive discounts and offers. They are your fans for a reason, thank them for continuing to follow you and interact with your page. Your business has a face, it's you and your staff. If you really want to connect with your fans, humanize your business. When you hire someone new, do a profile piece on them and post it. Ask your employees a question and post their responses. Build that relationship between you as a person and your fans. Relay a story about your business, fans engage with people that they know or want to know. Start a conversation and develop a voice. Give your posts some personality. Put the fun into your page. 8. Give to charitable events and PROMOTE that event! We all get calls to donate to various charitable events all year long. GIVE A TICKET PACKAGE TO EVERY ONE OF THEM. Besides promoting your business through charitable giving you are growing your brand awareness in places you may have not penetrated yet. I have tons of stories where the donation of a two pack of tickets has led to hundreds, or thousands of dollars in revisits. As an example a local realtor had won two tickets at a charity auction. She came for date night with her husband and had a great time. The next weekend she brought her children. The next month she brought here ENTIRE COMPANY. She did this not only once, but twice! The Smash Shack, one of the business pages we follow and partner with for cross-promotion is hosting a charity event next month. They are having a car smash to benefit the Roc4Vets organization to help end veteran's homelessness. I shared that event on the Cracked it! Escape Games Facebook, Twitter and Instagram. I also created a Google Post announcing the event. Up until the event I will continue to help promote it. By helping support this event and others like it, Cracked it! Escape Games is furthering our reputation as an organization that continues to #GIVEBACK. We are not losing anything by helping to promote this event. We are increasing the exposure of this event to our fans and hopefully they will have a rocking turnout. We will also be donating a gift basket for them to auction or raffle off at the event that will contain tickets and other fun stuff. Our Facebook fans are not faceless, nameless people. Are you getting ready to plan a new escape room. Throw out a question to your fans and see what their reaction is. Are you designing a new T-shirt? Create two versions of the shirt in different colors and see what your fans like. They have something to say. You can gain tremendous insight about your customer base by engaging them with thoughtful questions. Facebook is adding all kinds of tools for us to use to expand our reach. Their latest innovation is the development of live-streaming video. There are tons of benefits to posting video content on your Facebook chief among them is expanding your reach. Last October our area was in the path of Hurricane Matthew forcing us to close early due to safety concerns. Having survived many hurricanes in North Carolina, I know that very often the power goes out for extended periods and people need something to do. Before we closed I went live and recorded a short video of 5 things to do when the power goes out. Todate the video has been viewed 322 times. One of the great benefits of livestreaming on Facebook is that the videos are persistent. They can be viewed long after you broadcast it. This further helps identify your brand as engaged and involved with your fans.